New name and cans - same product! Skruf calls Xtra Stark Portion Probably the strongest snus out there. Why they won't come right out and say how much nicotine it has is a mystery to me. If it's a new marketing idea, I don't like it. 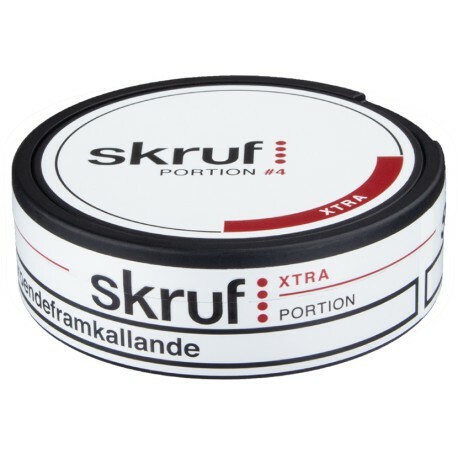 To make this extra strong snus Skruf uses specially selected tobaccos to give the rich taste and higher impact! What a nic hit indeed! Try the first portion at home sitting in a chair with your seat belt on! After reading the other comments I was a little hesitant to order but I think they may have listened. I have a portion in most of the day and this one is always guaranteed to make me feel. To me this delivers more of a punch than Siberia & Offroad, so much so it's just a little too much in the morning but fantastic after something more gentle and on the 2nd cup of coffee. The taste is slightly similar to that of General white, but way more flavorful and of course way more of a drip. Will definitely order again. This one was a bit of a let down for me. The flavor is great, along with the quality, but I feel they must have lowered the nic content to somewhere in the 1.2% -1.4% range. As a reference point, I use maybe 2-3 portions a day with 1-2 of those being ES. Wont be buying again till they start providing figures. Its a quality snus but if you get it thinking its going to be on par with odens extreme or thunder ultra you will be disappointed. And from their own description as, "one of the strongest snus out there", why shouldn't you expect it to be? All time 'Favorite' SNUS. I ALWAYS add some water to the can. This seems to 'Unlock' some of the nic. content. I have noticed w/ the 'wet' stuff I can get Very Bad Breath. Am Ordering more today! One of my favorite Snus products. Always order it 10x cans at a time. Very strong, gives a great buzz, fairly inexpensive, drip can taste a little nasty after about 40 minutes though which is the only negative. Also, when the cans come in the mail, the little Snus pouches always seem to be slightly smushed. Great product, and cool can. This is indeed a strong one, and I like it for driving in traffic. Not something you want for bumper-to-bumper, but out on the highway, where you can enjoy the buzz with the pedal to the metal. Has a good flavor, a great nic hit, and lasts pretty long. It sometimes gets bitter towards the end, but that is to be expected with the strong portions. Not the best, not the worst, but it has its uses. Okay flavor of strong grapefruit rinds. BIG nicotine hit. Most users say you should have it in the morning or after a meal but the funny thing about nicotine is that in large doses, it acts as a sedative with an opiate like effect. In small doses, it acts as a stimulant. So after trying this, I would recommend it if you are having a crappy day at work - toward the end of the day rather than trying to wake up with it at the beginning of the day like some suggest. This is good quality snus and delivers as advertised. Has a nicotine hit for sure but thats why im a snus user and not a smoker. Takes care of the cravings. Not sure you should use this at work while operating heavy machinary. More like after a large meal or when u want to get f'd up after a morning coffee.